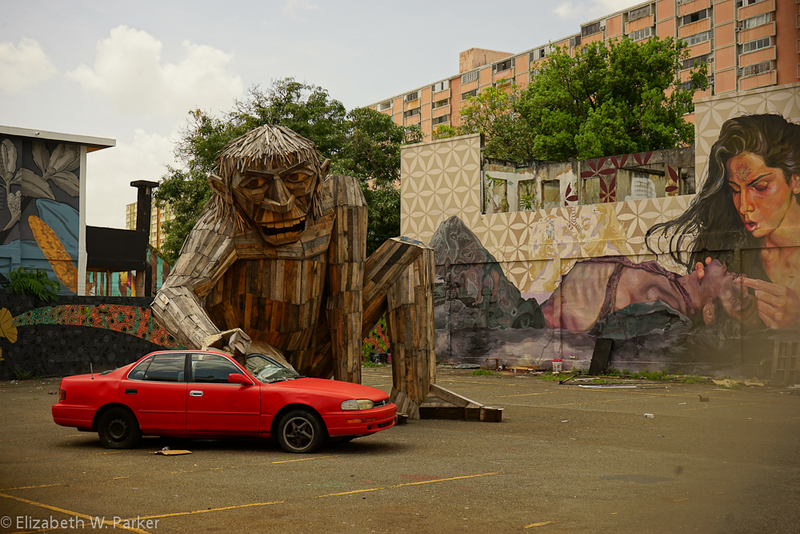 Last weekend, I revisited the district in Santurce now known for its murals. Though in the previous post on the same topic (below), I referred to Santurce es Ley occurring in August of 2014, this year (2016) it occurred mid-March. I thought I would see more and more murals, as the painting would spread across the buildings in the sector, but as I looked at the images I posted last year, I can see that many of those murals were painted over. Is this ephemeral quality of the murals also part of their definition? Art or graffiti? Painting on the sides of buildings (public or private), who decides? After taking a walk through a couple of streets in Santurce (neighborhood of San Juan, Puerto Rico), I have defined graffiti as street painting with mostly words and art as street painting with mostly images. Arbitrary – but it works for the slide show I want to show you. The murals in Santurce are the result of five years of a festival called “Santurce es Ley“. Don’t ask me to translate that because it makes no sense to me… Last held in August 2014, I suspect that another one will be held this year – August again? I am not sure if each year there is a theme, or if the festivals (and therefore the murals) are dedicated to anyone in particular…but I am sure that you will see the faces of recognizable Puerto Ricans, lots of mouths (! ), fish and many female faces and bodies. See what you think…and leave your comments. If you go to visit them yourself (a perfect activity for this Easter weekend when no one else is in San Juan) head for the area around Calle Cerra between Ave. Fernandez Juncos and Ave. Las Palmas. We found a treasure trove there!